THE VESSEL COLLECTION TAKES ITS INSPIRATION FROM A DIVERSE RANGE OF NATURAL SOURCES. AMANDA’S ABSTRACTED COMPOSITIONS EMPHATICALLY COMMUNICATE THE INTRINSIC BEAUTY AND SUBTLETY OF NATURE’S MANY VARIED FORMS. THE VESSELS HAVE A MARVELOUS FLUENCY ABOUT THEM. 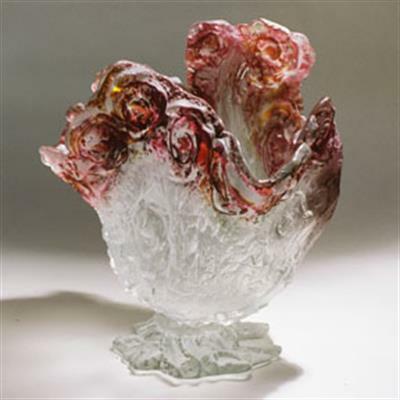 EACH MOULD IS INDIVIDUALLY MADE, AND AS THE MOLTEN GLASS BEGINS TO SOLIDIFY IT IS MANIPULATED INTO NEW AND WONDERFUL SHAPES. AMANDA’S METICULOUS UNDERSTANDING OF HER CRAFT INFORMS HER EXACTLY WHEN TO INTERVENE WITH THE MOLTEN GLASS AND TRANSFORM IT INTO SOMETHING REMARKABLE. AMANDA’S VESSELS ARE MADE TO ORDER AND CAN BE COMMISSIONED FROM A STUNNING COLOUR PALETTE.